Anthony Thomas Voyce was born in Gloucester on 18th May 1897, the son of Thomas, a lighter captain, and Annie Voyce. They had ten children, of whom three died in infancy, leaving Tom with six sisters. When Tom was a young boy, the family lived at Chapel Passage, St Mary’s Square, but by 1911 they had moved to 59 Deans Walk, within a stone’s throw of Kingsholm, and Tom was a student at the National School, Gloucester. Tom quickly made his mark in schoolboy rugby representing Gloucester against Cheltenham and Bristol. On 4th February 1911, an England schoolboy trial was played at Kingsholm and Tom was chosen at centre for the West against the East. He was described as “a strong as well as clever three-quarter, who plays on the wing or at centre. He has won prizes in swimming, and also gained a life-saving certificate.” At the time he weighed in at 7st 8lbs and stood at 5ft 3½ ins. Tom was one of three Gloucester boys selected, alongside Sid Brown and Albert Langford, to play for England Under-15 against Wales at Leicester on 4th March 1911. Tom played at fly-half. Langford kicked the drop goal which won the match 4-3, but it was Voyce and Brown who would go on to make their names at senior level. Tom had just started to play senior rugby with the local Gordon League club, when his progress was cut short by the outbreak of the First World War. He was listed amongst “Our Citizen Soldiers” whose names were published in the Gloucestershire Chronicle on 5th September 1914 as having enlisted from Messrs J Pearce Pope and Sons. He enlisted as a Private (2215) in the 1/5th Battalion, Gloucestershire Regiment, but having been found to be under age, he was sent home. However, on reaching his eighteenth birthday, he joined the 2/5th Battalion, Gloucestershire Regiment and landed in France on 26th June 1916. He was promoted to the rank of Sergeant (240435), but in 1917 he was wounded in the right eye which left him with permanently impaired vision for the rest of his life. He subsequently gained a commission as a Second Lieutenant on 1st February 1919 in the 3rd (Reserve) Battalion, Queen’s Own Royal West Kent. He took full advantage of the limited opportunities during the war of playing in Services matches, and for one of these he was selected as a forward, which would eventually set the mould for the rest of his playing career. He took part in the Whites v Blues Army trial in February 1919, playing against former Gloucester player, Cornelius Carleton. Tom was subsequently selected to represent the Home Army against the British Expeditionary Force (France) on 22nd February, from which his team came out winners by thirty-six points to eight. He developed his game rapidly, and leading critics who spotted him at a match at Oxford, referred to him as a forward to be watched. Following the war, Tom commenced his career in insurance. Club rugby resumed at Gloucester on 21st December 1918. There was only a limited fixture list, mostly against military teams, for the 1918-19 season, but Tom played in six of the eleven Club fixtures. Initially seen, as during his schoolboy career, as a back, Tom made his debut for Gloucester in the next game on Boxing Day against 4th Reserve Gloucestershire Regiment. He was selected to play on the wing, but a late withdrawal caused him to be switched to fly-half to play outside “Father” Dix. For his next game on 25th January 1919, Tom was selected on the bench, but ended up playing at fly-half again, this time paired with Arthur Hall. For his next game against Leicester, he played at centre, and was also selected there against Cardiff, but was again switched to fly-half, this time alongside a third different partner in R C Cook. For the final two games of the season against the RAF and a Canadian team, he played as a forward. A full fixture list was arranged for the 1919-20 season and Tom became a regular in the Gloucester side. Tom’s first appearance was against Cheltenham on 4th October 1919, when he played as a forward, a position in which he would remain for the rest of his playing career. He scored his first try for the Club against Old Merchant Taylors on Boxing Day 1919 in a 15-0 victory. He scored another in the final game of the season against Abertillery, having made 19 appearances, a number much reduced by Tom suddenly being in great demand for representative rugby as he made an astonishingly quick rise to the top of the sport. Tom jumped into prominence at an astonishing rate, gaining his Club, County and International caps in quick succession. His debut for Gloucestershire was against Cornwall at Kingsholm in the County Championship on 13th December 2019; Gloucestershire won 18-8. He went on to play in the 7-3 victory over Somerset, and then in the semi-final away to East Midlands at Northampton, where Gloucestershire won 16-11. But he was surprisingly omitted for the final when Gloucestershire went up to Bradford and beat Yorkshire 27-3 to become County Champions, whilst Tom was playing and scoring that try for Gloucester against Abertillery. Tom was selected for an England trial at Liverpool on 6th December 1919, when he played alongside George Halford and Sid Smart, his team mates from Gloucester. They were in the England side which beat the North 25-15. His performance won him a place in the England side for the next trial at Twickenham on 3rd January 1920, again alongside George Halford. They beat the Rest, including “Father” Dix and Sid Smart from Gloucester, 30-16. Tom missed out on selection for the opening internationals of the season against Wales and France, but won his first England cap in the 14-11 victory over Ireland at Lansdowne Road, Dublin, on 14th February 1920. He played his first game at Twickenham for England on 20th March 1920 in the 13-4 defeat of Scotland. As regards representative rugby, his season could not have been better. For the County, he played in all three South West group games as Gloucestershire beat Devon 15-3 with Tom kicking a penalty, saw off Somerset 20-0 with Tom scoring a try and kicking a conversion, and narrowly squeezed home 9-6 against Cornwall at Camborne to qualify for the knock-out stages. Tom played a leading role in their semi-final victory 21-3 over Surrey and in their crowning as County Champions with a massive 31-4 triumph over Leicestershire in the final, both games being played on his home turf at Kingsholm. Tom was duly selected for the senior side in all three England trials, but was unable to play in the first. In the second he was back to help England defeat the South 31-8, and in the third he scored a try as England beat the Rest 14-3. He was a firm fixture in the national side for all the internationals that season as England secured victories over Wales 18-3, Ireland 15-0, Scotland 18-0 and finally France 10-6 in Paris to complete the Grand Slam. Despite a string of representative commitments in 1921-22, Tom turned out in 29 games for Gloucester, scoring seven tries, including two on Boxing Day against Old Merchant Taylors. He again had a wonderful season with Gloucestershire and England. He played in each of the County group games, when Devon were beaten 9-6 and Somerset 16-6, before he scored a brace of tries in the decisive 34-3 win over Cornwall, which set up a semi-final against Surrey. He missed the drawn game at Richmond, but was back for the replay at Kingsholm, when he scored a try as Gloucestershire romped home 30-0. He was one of nine Gloucester players taking part in the 19-0 win in the final against North Midlands at Villa Park, which completed a hat trick of County Championships for Gloucestershire. England again held three international trials in 1921-22, and Tom played for the senior side in all of them. He scored a try in each of the first two as England beat the North 44-13, the South 29-14, and the Rest 24-8. He was again a fixture throughout the Five Nations, starting with a 6-28 setback against Wales in Cardiff, Tom’s first taste of defeat in an England shirt in his seventh international. 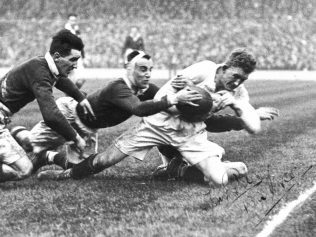 But Ireland were defeated 12-3 and Scotland 11-5, whilst Tom scored his first try for England against France at Twickenham on 25th February 1922 in an 11-11 draw. He played in the County’s three South West group matches They beat Devon 16-11 and Cornwall 9-7, but a narrow 8-10 loss to Somerset at Bridgwater, their first defeat in the County Championship since the Great War, put them out of the competition. Tom was again an ever-present in the England team for the three international trials, which were won 18-6 against the North, 6-3 against the South and 39-8 against the Rest, Tom scoring tries in the first and last of these games. This was plenty good enough for him to retain his place in an England side which won the Grand Slam. Tom scored a try apiece in victories over Ireland 23-5 at Leicester, and Scotland 8-6 at Inverleith. Wales were beaten 7-3 at Twickenham and France 12-3 in Paris. In 1923-24, representative commitments again fractured Tom’s season with Gloucester, and he manged only 19 appearances for his Club, but nevertheless contributed nine tries. Indeed he scored a try and dropped a goal against Lydney in the opening game of the season, and also dropped a goal in the following game against Bath – these were to be the only dropped goals which he kicked in his entire career. He also figured prominently in two of the best Gloucester performances of the season, scoring a try from more than half-way in the 8-6 win over Newport, and another in the 11-8 defeat of Llanelly. By now he had a certain reputation for saving his most fierce performances for the Welsh, so it was no surprise when he helped himself to two tries against London Welsh. For the County, he scored a try in their first game against Devon, which was won 12-8 at Torquay, and another in the 24-8 win over Cornwall at Kingsholm, but in between Gloucestershire were tripped up 3-9 by Somerset at Bristol and consequently failed to progress from the group stage. Having watched Tom perform for the South against the North in an England trial in December 1923, the Times reporter stated “Tom Voyce appears to be playing better than ever; his keenness, stamina, personality and true Rugby sense make him one of the most remarkable of all forwards”. Unfortunately Tom was unable to play in the remaining two trial matches because of injury, but he was back in the England side when internationals commenced in the New Year and remained a fixture for another season. It was here that Tom earned the title in the newspapers of “Scourge of the Welsh”. It was Tom’s 15th cap, a record for a Gloucester player at that time, surpassing the 14 won by Frank Stout. The jersey Tom wore in the match remains with the Swansea club. The match was described as “a desperately fought game, and there were numerous casualties”. Tom was one of them – he had to leave the field for a short time soon after half-time – however, he resumed and played a full part in the English victory. It was reported after the match that he had a broken rib, but, back in Gloucester on the following Monday morning, he went for an x-ray, which showed his rib to be badly bruised but not broken – “the International was naturally feeling the effects of the injury, but he was quite as well as could be expected, and was able to carry out his intention of accompanying Frank Ayliffe for a couple of days’ shooting”. There followed a victory over Ireland 14-3 at Ravenhill, Belfast, and then two home wins at Twickenham over France 19-7 and Scotland 19-0, which saw Tom and his England team mates celebrating back-to-back Grand Slams and a place in history. I appreciate the honour in having the opportunity of writing these few sentences for this day of days, in commemoration of our Jubilee Celebration. The Gloucester Football Club has done much in the furtherance of Rugger. We like to think of ourselves, as we believe others do, as being one of the main-stays of British Rugger, which, to my mind, is the greatest game in the world. I have played a good many games for Gloucester, and also for England, but the proudest day of my life will be to lead out my team for this, our Jubilee Match. As you probably know, I had the wonderful privilege of touring with the British side in South Africa, and I am sure I gained much experience and knowledge, not only about Football, but also business facilities out there. This, combined with the grandeur of the scenery, the wonderful mountains, and the limitless extent of Veld, combined with coming into personal contact with gold, diamonds, ostriches and orange groves, not to mention locusts, monkeys, and numerous wild animals, is indeed an experience that will live in my memory for ever. At De Beers’ Diamond Mines, at Kimberley, we saw thousands of diamonds, and when one realises this enormous firm controls the diamond market of the world, it will give you an idea of what Messrs. De Beers were so kind to show and explain to us during our most pleasant visit to Kimberley. One realises that this town of Boer War fame exists to-day purely on a luxury, and I am sure if some of the ladies could realise what preparations, difficulties, organisations and hardships were necessary to obtain their jewels out of Mother Earth, they would, if possible, appreciate them the more. We were entertained right well, with the usual hospitality, at Oudshoom, the ostrich district, and it might be interesting to note that ostriches can run at nearly 40 miles per hour, (I heard some people say 60), and often one sees them racing the trains. We were assured that the clipping of the feathers entails no pain to the ostriches, and consequently “wearers” need have no scruples. Ostriches are very dangerous birds, as we had cause to know on one occasion, having endeavoured to obtain a close-up photograph of the champion bird, and personally having to take a flying dive over a wire fence, closely followed by Ian Smith and Jamie Clinch. We were somewhat interested to learn afterwards that our pursuer had been the means of death to three men during its short life, namely 6 years, and congratulated ourselves on our escape to tell the tale. The best feathers are from birds 5 years old, and although they live much longer, a deterioration is noticeable as each year passes. The average cattle farms vary from 6,000 to 16,000 acres, and as we were taken over many of these for shooting and general inspection, we were given a good opportunity to make comparisons with ours. Sugar, in Natal, seemed to be the chief farm product, combined with bananas and pineapples, consequently monkeys, especially in this district, were often seen in swarms, notably in the sugar fields. The climate is wonderful, and although we were there in winter, the sun shone brilliantly each day, and it was much too hot for football. Water and locusts, we found, to be the South African farmers’ chief troubles, and although they have many more, in sympathy with their brothers across the water, we were amazed to find the expenditure Government, County Councils and farmers deemed necessary to erect dams and irrigation systems. Whether we met South Africans or Britishers, we were honoured guests, in every sense of the word, and no effort or hospitality was spared to entertain us, and show how really welcome we were. Mayoral luncheons, banquets and entertainments we were privileged to take part in, on numerous occasions. All shops were closed on Match days, wherever we were playing. Schools, offices and work received a holiday, showing, undoubtedly, that we, as Britishers, were indeed welcome. Our Rugger in South Africa was hard work, but the foregoing will explain our consolations. We realised, and appreciated, the fact that we were representing Britain, and Rugger is a fit man’s game. Therefore, from the time we sailed from England on board the Edinburgh Castle, we did physical training twice each day, and in South Africa, each day, when we were not in trains, we ran and had practice games. So we played right through, keeping fit and keyed up for our hard task. The grounds would be a revelation to you, as they were to us. Hard, virgin soil, some newly ploughed, but a few hours of the sun, and they were hard once more. Red earth, hard, but clouds of dust, especially in the scrums, almost everywhere. Consequently, it was impossible for the spectator to discover whether “these winging forwards” were pushing their weight. Nevertheless, although the rugger was fast and keen, all teams endeavouring to play the open game, we met sportsmen, and the British side left South Africa, having cemented the bonds of friendship with South Africa, which, I am certain, will last for ever; and I express the hope that our tour will be the means of closer uniting the interests of our two nations, not only in our Rugby activities, but in all walks of life, and should we have fulfilled this desire, surely we may write success after the B. S. A. T. South African tour. During his absence in South Africa, Tom missed the Gloucester Club AGM at which he was elected captain for the forthcoming 1924-25 season. He did not return to Gloucester until after the season had started, and therefore missed the Gloucestershire match against the touring All Blacks at Kingsholm on 25th September. However, he was home in time to lead Gloucester in the special jubilee match to celebrate the 50th anniversary of the Club on 13th November 1924. Gloucester played against a side raised by Capt Donne, President of the RFU, which included seven internationals. Gloucester were strengthened with the services of three Oxford University players, and Tom scored a try in a famous 11-9 win. Tom had warmed up for that game by scoring two tries for Gloucester against Plymouth Albion, and one against Oxford University, in the space of five days, but overall during his first season as captain of Gloucester, Tom was available for only 19 of the 40 games played. After the jubilee match, he felt that he needed a break, so he played no rugby for a month from mid-November to mid-December. However, he did finish the season by going on the Club tour, and scored tries in the wins at Devonport Services and Sidmouth. The team ended up winning 24 games, losing 15 and drawing one, with 430 points for and 308 against, with Tom contributing six tries, one conversion and two penalties. The season was marred by the untimely death of Stan Bayliss, who dislocated his neck in a match at Kingsholm and died of his injury. Tom’s appearances for Gloucestershire were also disrupted. He played in the first group game, a 33-6 thrashing of Devon, but missed the remaining group fixtures. Nevertheless, the County qualified for the knock-out stages, and Tom returned for the 10-9 semi-final win over Middlesex at Kingsholm, and the 6-14 loss to Leicestershire in the final at Bristol. 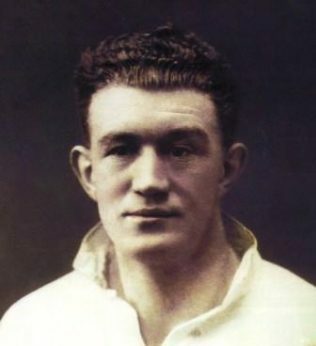 Tom continued to be a power for England, playing in two trials, at Bradford and Twickenham, although he was substituted at half-time in the latter game. Indeed Tom was only brought into the England side for their first international, against the All Blacks at Twickenham on 3rd January 1925, when H L Price was injured. England lost this match 11-17 in front of 60,000 spectators, despite C Brownlie of New Zealand being sent off after ten minutes for kicking an opponent. Tom was retained for all of the Home Nations games. He scored a try in the 12-6 victory over Wales, but a 3-3 draw against Ireland put paid to another Grand Slam, before England lost 11-14 to Scotland, and beat France 13-11. After a summer away from rugby, Tom started the 1925-26 season with a flourish, scoring tries in each of the first three games against Stroud, Lydney and Old Edwardians. He was outstanding against Cardiff, when he scored both tries in an 8-8 draw, and he added another brace of tries against Oxford University. Representative honours then reduced his availability for Gloucester, so that he ended up playing in only 15 of the Club’s 37 fixtures, during which he scored seven tries, two conversions and two penalties. In his second term as captain, Gloucester had an unexceptional season, winning 19, losing 17, drawing one and scoring 430 points against 283, but the major disaster of the Club’s season was when Tom’s vice-captain, Sid Brown, was injured during a match at Kingsholm and died the following day in Gloucester Royal Infirmary – a second fatality in two seasons (the only ones to have occurred throughout the Club’s history). Tom played for the County in the 11-5 victory over Devon at Exeter, and in the 9-10 loss to Somerset at Kingsholm, which put Gloucestershire into a playoff, but Tom was not available for either this game, nor the subsequent semi-final which was lost to Hampshire. He played an all three international trials, scoring a try in the first, and two in the third. For England Tom was again a fixture during the Home Nations in what was to be his last season as an international player. It started with a 3-3 draw in Cardiff, followed by a 15-19 defeat in Dublin. 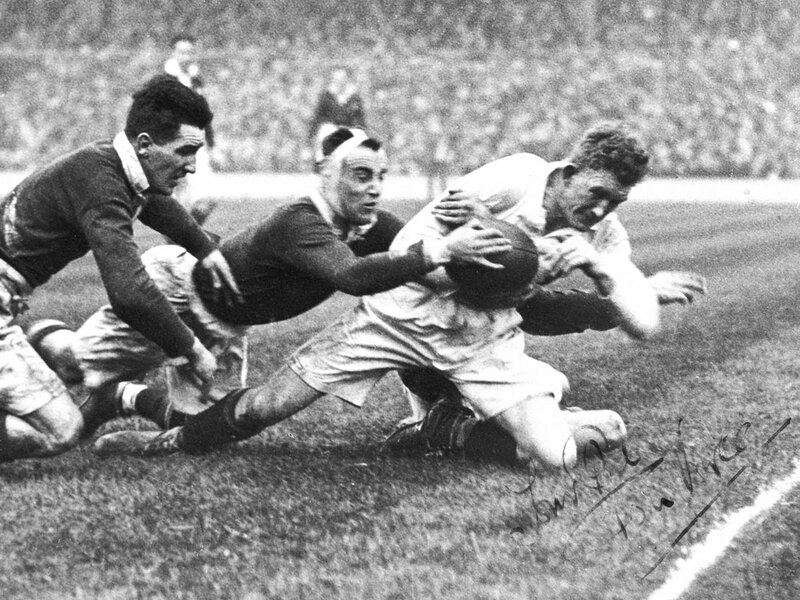 After an 11-0 success against France, Tom scored a try in his last game for England against Scotland at Twickenham on 20th March 1926, although the game was lost 9-17. In 1926 Tom married Hilda Fanny (‘Pat’) King and the couple had two children, Thomas Guy (born in 1932) and Prunella (born in 1928). This was Tom’s third and final season as captain of Gloucester, and it was injury more than representative commitments which kept his Club appearances down to 17 of the 40 Club matches, during which Tom contributed six tries and a conversion. The team again had an indifferent season, winning 23 and losing 17, whilst scoring 413 points against 398. At the end of the 1926-27 season, WB wrote “Voyce, when he was fit and all out, was a valuable asset, but the International’s appearances were all too few”. For the County, he played in a friendly against Yorkshire at Kingsholm, when he scored a try in a 14-4 win. In the County Championship Tom was selected for the Devon match at Bristol on 23rd October 1926, which was lost 0-10, and marked Tom’s final appearance in a Championship game. However, his final appearance for the County was against the touring Maoris at Bristol on 10th November 1926, when a Tom Millington penalty decided it 3-0 in Gloucestershire’s favour. For Gloucester, Tom made 171 appearances, scoring 55 tries and kicking 14 conversions, 6 penalties and 2 dropped goals for a total of 219 points. For Gloucestershire, Tom won 28 caps, scoring seven tries, one penalty and one conversion, for a total of 26 points, and was in three successive Championship winning sides. For England, Tom won 27 caps, scored five tries, and won three Grand Slams. Tom also represented the Army and the Barbarians. Following his retirement as a player, Tom threw himself into rugby administration, was immediately elected onto the Gloucester committee, and served the Club in many capacities. He was elected Chairman on the death of John Brookes in 1939, a position he held until 1947. He also went onto the County Union Executive, where he remained for forty years. He became Gloucestershire’s representative on the Rugby Union committee in 1931, was a county selector, and served as President for two seasons, 1933-35. During World War II Tom served as a Major in the Royal Army Signal Corps, and was prominent in securing Kingsholm as the venue for wartime internationals between England and Wales. career in insurance progressed, and he became a District Manager of Royal Exchange Group and a Director of Lowndes Lambert Groups. Amongst his many civic appointments, he served as a Gloucester City Councillor, a Governor of the Royal Infirmary, Chairman of the Gloucestershire Playing Fields Association and President of the St John Ambulance Brigade in the County, and served on the War Pensions Committee. He became President of the RFU in 1960-61, the only Gloucester man ever to have achieved this honour. He was awarded Officer of the Most Excellent Order of the British Empire (OBE) in 1962for services to sport and for public services in Gloucestershire, particularly with the National Playing Fields Association. After many years as a Vice-President of his beloved Gloucester Club, he replaced “Doc” Alcock as President of the Club in 1969. He finally brought his tenure to an end in 1979, saying that he wished a younger man to take on the job, and handing over to his old friend, Canon Mervyn Hughes. Tom died suddenly on 22nd January 1980 at home at 21, Tewkesbury Road, Gloucester, aged 83 years. His funeral was held at the Gloucester Crematorium. On 1 February a Memorial Service was held at Gloucester Cathedral attended by a congregation of several hundred including representatives from the Rugby Union, the Gloucester Rugby Football Club and the Gloucestershire Regiment. Mr. Anthony Thomas “Tom” Voyce, the “Grand Old Man” of rugby football, died suddenly at his home, 21 Tewkesbury-rd., Gloucester, yesterday afternoon at the age of 83. 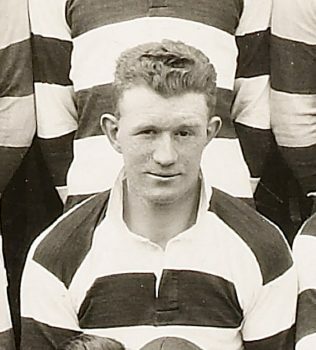 Tom, whose name and that of Gloucester RFC are virtually synonymous, was the club’s most capped player, having made 27 appearances for England, the first as long ago as 1920. He was often referred to as the “father of all wing-forwards,” such was his mastery of the tactics and technique of what we know in these modern days as a flanker. Born in Gloucester and educated at the old National School, Tom had served the game of rugby as player and administrator longer than any other man – for more than 60 years. 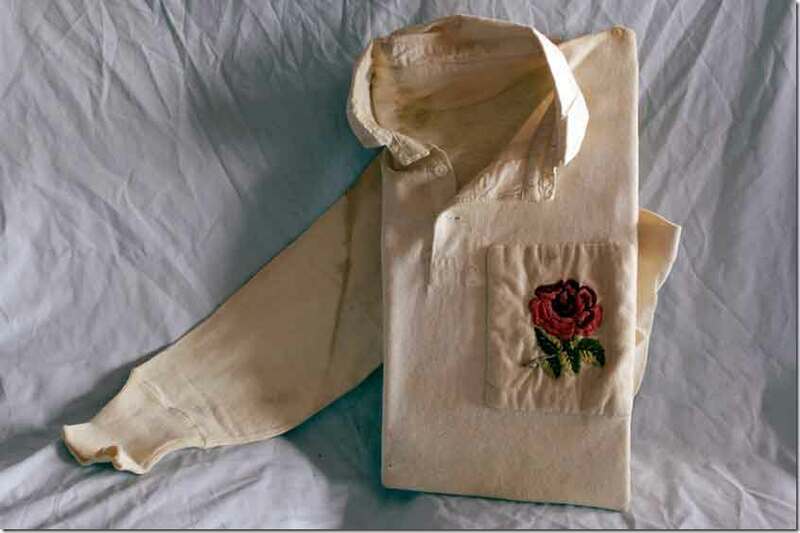 He played for England Schools at 15 group level before the first world war – but as a fly-half. He joined the Gloucestershire Regiment as a private at the outbreak of the First World War and was later commissioned into the Royal West Kents after attending Sandhurst College. Wounds sustained during the war affected his sight for the rest of his life. During his army service he became a forward when he found his name in one of the packs for an Army trial match. The name of Tom Voyce quickly became a by-word in the game of rugby all over the world. Apart from his England appearances, Tom played for Gloucestershire, the Army and Barbarians. With the British Isles team in South Africa in 1924 he played in two internationals and ended the tour as the leading scorer. Although he was also known as the “scourge of the Welsh” older enthusiasts in the Principality still revere and respect him as the really great, tough English forward, the one they liked to hate the most. As an administrator, Tom served on the Rugby Union committee from 1931 until its centenary in 1971, and was elected its president in 1960. He was also awarded the OBE for his public work in Gloucestershire, particularly with the National Playing Fields Association. It was only last summer that Tom stepped down from the post of president of Gloucester RFC, saying it was time he gave way to a younger man. The position was taken over by Canon Mervyn Hughes, a friend of many years. His business career was in insurance and he was the district manager of the Royal Exchange Group and a director of the Lowndes Lambert Group. He was also a member of the Gloucester City Council, representing Linden ward for the Conservatives, and was active in many other organisations, including the Municipal Charities, the Gloucester Royal Infirmary Governors, the Hospital Welfare Committee, the British Legion, the War Pensions Committee, the City Youth Committee, the Boy Scouts, the National Savings Committee and the Road Safety Committee. He is survived by his widow, Pat, an unmarried son, Guy, a married daughter, Mrs. Prunella Simpson, of Thornbury, and four grandchildren. Referring to his rugby career, Canon Hughes said Tom Voyce first played for England schoolboys in 1911 and went on to play at club, county and international level before a career as an administrator, culminating in a term as president of the Rugby Union. He said Mr. Voyce was a “true son of Gloucester” who adopted as his motto in life, the motto of his old school, the Gloucester National School, now demolished. “That motto was “Never Step Backwards” which epitomised his life and which would not be a bad motto for the world in which we live today,” he said. “He contributed so much to life and, indeed, became a legend in his own lifetime. His one regret would be that he was not here to enjoy this service today,” he added. Mr. Voyce died suddenly at his home in Tewkesbury-rd., Gloucester, at the age of 83, on January 22. He was the Gloucester club’s most capped player with 27 England appearances and was often called the father of modern wing-forward play. He was prominent in many other fields of public life including a spell on Gloucester City Council.